The Split Shot rig is one of the best finesse fishing techniques that you can use in pursuit of the black bass. The bass is a bit more skittish in clearer water then in murky water. This is where finesse fishing and more specifically this rig excels. Much like the weightless rig, this rig presents your bait in a very natural way. This is also one of the simplest techniques to fish with and works very well in any depth of clear water. The action of the split shot rig is completely natural. By using a small weight it allows the bait to slowly sink more vertically and triggers a reaction bite from bass. In the right circumstances, this rig will produce very well. I use this technique anytime that the bite slows or the water is heavily pressured. Much like the weightless rig this technique will teach you patience. Many times the best way to target bass is by slowing down your presentation and switching over to lighter tackle and finesse fishing. Much like the weightless rig, the conditions have to be favorable in order for this to work correctly but when the wind is low it is hard to beat this rig. To present this rig to the wily bass in the correct fashion, you need to have a medium light to light power rod with a very fast tip. I prefer a 6’ spinning rod. Bait casting equipment is just too big to handle this type of finesse fishing. I always like to use a smooth action open face spinning reel. The reel should always be balanced with the rod. Like all finesse fishing, the line that you need to use is very important. I will use the lightest possible line I can get away with. Of course, if you are waters that produce 10 pound fish it will require heavier line to be used. 8 pound mono is a good choice but the new fluorocarbon lines do work very well for this application due to their transparent and strength qualities. You will need to tie a hook that matches the plastic you will be using as bait. Many types of plastics work well with this technique. You can use anything from a small curly tail grub to a large 10” worm or any other creature type bait. Take a split shot sinker and pinch it onto your line at 12 to 24 inches above your hook to form a leader of sorts. It is important that you only use 1 single weight and that it is large enough to get your bait to the bottom. Over hand casting of this rig will cause it to spin through the air and end up tangled. A much better technique is to use a side arm motion and lob cast it as far as possible away from you and towards your target. Let the rig sink to the bottom, twitch and shake it a few times and then slowly begin to retrieve it. Make sure to shake it or twitch it every so often during the retrieval. 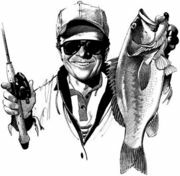 If you feel a bite, drop your rod tip and wait for the fish to take the bait and then set the hook hard. Very much like the weightless rig, the split shot rig is basically just throwing your lure to your target and waiting for it to sink to the desired depth. It is very important to keep a close eye on your line while using this technique. Not only are you watching for a bite as the lure falls, but you also need to keep an eye on it once it gets to the bottom. Many times the fish will take this on the fall but they also like it when it is lying on top of the weed bed or the bottom of the water.